In a small saucepan warm olive oil over medium-low heat, add the garlic, and cook for 1 minute. Remove the pan from the burner, add the white wine, lemon zest, lemon juice, oregano, thyme, and 1 teaspoon salt and pour into a baking dish. Place the chicken breasts with the skin side up on the sauce. Brush the breasts with olive oil and sprinkle with salt and pepper. 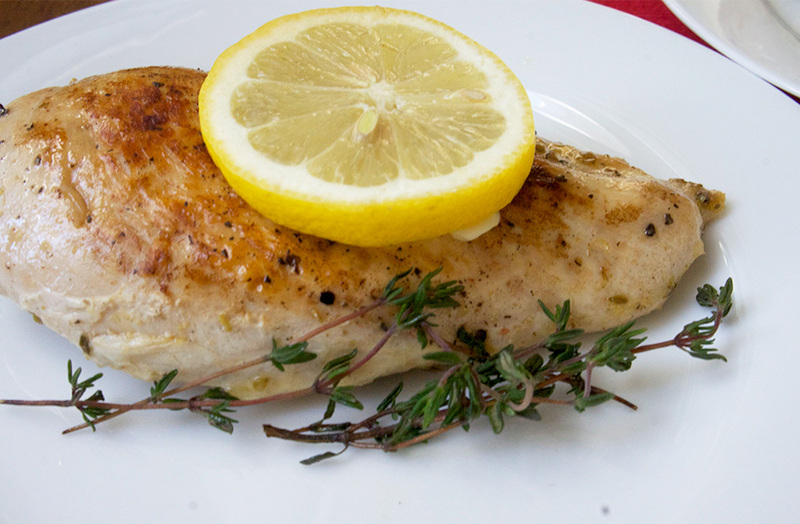 Place lemon wedges on top of the chicken. Bake for 30 to 40 minutes, until the chicken is lightly browned and cooked through. If the chicken is still pale, brown it under the broiler for a few minutes. isn’t browned enough, put it under the broiler for 2 minutes. Serve with the pan juices.